The Order of Release by John Everett Millais depicts the homecoming of a Jacobite rebel to his not so sympathetic wife in 1746. A little bit of background: the Jacobite rebellion was an attempt to overthrow the British throne in an effort to give power back to James Francis Edward Stuart and his sons in the mid-1700s. It was spearheaded by James Francis Edward Stuart’s son, Charles Edward Stuart, also known as Bonnie Prince Charles. They made it all the way to Derby before the leaders of the rebellion decided that they should turn back, realizing that they were vastly outnumbered by the government armies. In 1746, the Jacobites' loss at the Battle of Culloden ended the entire uprising and many of the rebels were imprisoned, including this guy. There is something a little off about this reunion though. The dog is happier to see this guy than his wife or kid. Obviously dogs are the absolute #1 best when it comes to making you feel like a hero just for coming home, but usually in a been-at-war situation the excitement levels between family and dog are at least matched. This situation is a little different. And it’s probably because the dog doesn’t know that the woman may or may not have had to compromise her virtue for the release of her husband. It’s just a theory, but by the look on the woman’s face, something about her husband’s return isn’t making her very excited. The kid is even worse. He doesn’t even wake up when his father comes home. I don’t care if he’s two years old, he’s being a jerk. The story depicted in this painting was fictional, but may have been inspired by the writings of Sir Walter Scott. 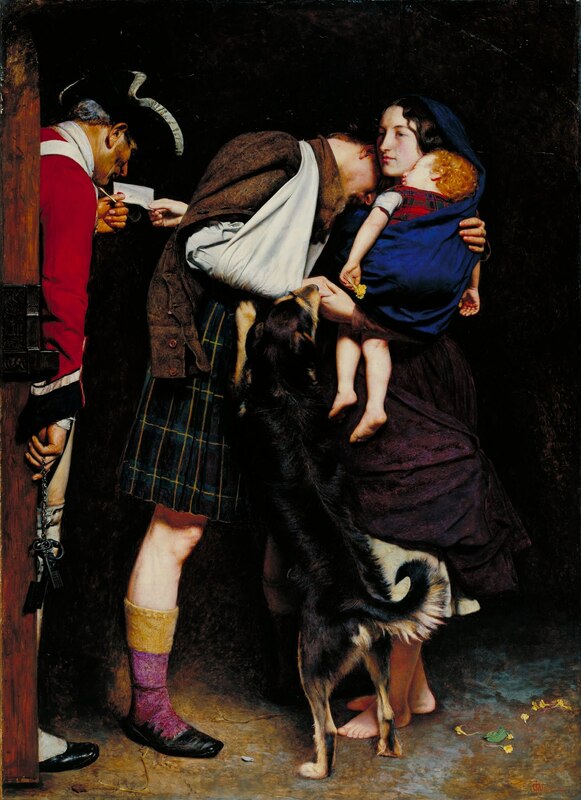 Millais made sure that every little detail, down to the tartans that the characters were wearing were accurate. At one point the painting was titled The Ransom and the woman was shown handing the man a bag of money. But then the painting was altered to show her handing him an order of release. Millais used his fiancé, Effie Ruskin as a model for the wife and a professional model named Westall for the father. The model for the kid was, according to Millais, a nightmare and a half to work with. The child “seemed so obstinate that she would not do anything I wanted, and when forced, by Westall's superior strength, squalled and foamed at the mouth.” It seems like they probably should have checked the kid for rabies, but what do I know. This painting was a huge hit when it made it to the Royal Academy in 1853. It was purchased by the lawyer Joseph Arden for £400 but made its way into the Tate by 1898. The Order of Release, 1746 is a painting by John Everett Millais exhibited in 1853. It is notable for marking the beginnings of Millais's move away from the highly detailed Pre-Raphaelitism of his early years. Effie Gray, who later left her husband for the artist, modelled for the principal figure. The painting depicts the wife of a rebel Scottish soldier, who has been imprisoned after the Jacobite rising of 1745, arriving with an order securing his release. She holds her child, showing the order to a guard, while her husband embraces her. The subject is simply that of a wife, with child in her arms, coming with an order of release for her husband, who has been taken in the Civil Wars. The husband, overcome with emotions, and weak from a recent wound (his arm is in a sling), can but fall upon her neck and weep; moan, "firm of purpose", sheds no tear; she has none to shed; but her eye is red and heavy with weeping and waking; and she looks at the stern and unconcerned gaoler with a proud look, expressing that she has won the reward for all her trouble past. The colouring, the textural execution, are marvellous (for these degenerate days). The dark, generalised background is a departure from the highly detailed backgrounds of earlier works such as Ophelia, as is the emphatic chiaroscuro. However, the portrayal of tense relationships disrupted by historical dramas was a continuation of the theme of A Huguenot and The Proscribed Royalist, 1651. While working on the painting, Millais fell in love with Effie, the wife of his principal supporter, the critic John Ruskin. A study for the painting has a drawing of her head on one side and an image of a man kneeling in supplication to a woman on the other, labelled "accepted". Check out the full Wikipedia article about The Order of Release.